I love a few "new" words sprinkled in a good book... at least, I love them when I recover from my initial feelings of stupidity. The new (to me) vocabulary words were used perfectly, when each was the absolute right word to use. Writers who do that further communication in general and the art of writing in particular. I am in awe of (and grateful to) Mss. Barrows and Shaffer for producing such a fine book. Think you can produce writing of a similar ilk? 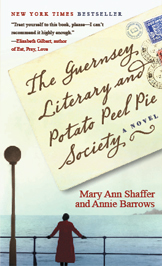 Try - for the month of August, Random House is soliciting entries for its The Guernsey Literary and Potato Peel Pie Society Essay Contest. Contestants should describe, in 430 words or less, their favorite book and what it taught them about a particular place and/or time period. Pens at the ready - and good luck! What 'the experts' say is probably no more informed than what your drunk uncle has to say. But HOW they say it, huh, that's what makes 'em experts. News consumers, beware. The National Press Foundation accepted $$ from Pfizer (drug company) to offer journalism fellowships? I hope the situation is a little better than it sounds at first pass. More here on Gary Schwitzer's health news blog. Should you or shouldn't you? Oft-heard advice says 1- don't, unless you really are next Dr. Seuss and 2- don't ever, ever, ever say you're Seusslike in a cover letter directed to a publisher. Supposed to be a surefire way to land on the slushpile, pronto. "Poetry is the journal of a sea animal living on land, wanting to fly in the sky." Joan Hyman, Associate Editor at Wordsong, the poetry imprint at Boyds Mill Press, reminds hopeful poets to - well, write well. "Though there is always room for light, fun verse, the best poets - and the best writers - know how to push the reader to think while keeping him or her entertained," she told Bradbury. Good advice. Here's some more: you're not the next Dr. Seuss, and you probably don't want to be. Read, write, join SCBWI, and you too just might inspire the next generation of readers (and writers)! An article (online) about selling articles online posted at Associated Content leads with how frustrating it can be to "sell" articles through AssociatedContent.com. Well, yeah. But it's not completely pointless, IMHO. More on that later, maybe. I'm taking the weekend off!